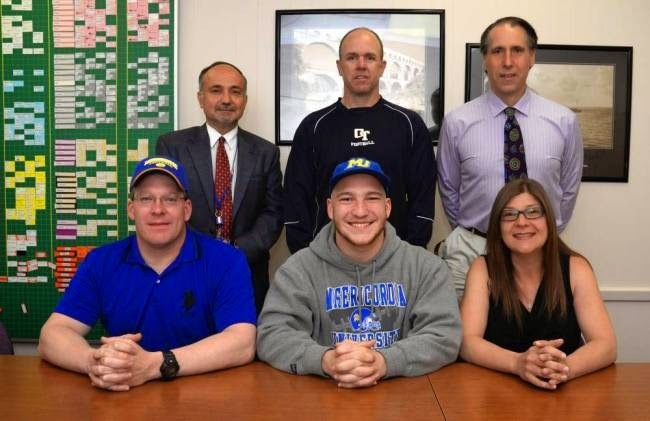 OLD TAPPAN - "I want to be a role model for him," said Golden Knights nose guard Scott Bargisen, who will continue his football career at Misericordia University. "I want him to look up to me. I love him very, very much." The "him" Bargisen is referring to is his younger brother Eric, who has autism. In Bargisen's senior year of high school he took good care of his sophomore brother, who has been "mainstreamed" for several years, by walking him to class the first two weeks of the school year. He also invited Eric to sit at his lunch table, along with Scott's fellow seniors. Bargisen's mother, Johanna, said Scott has been helping Eric for a very long time. Golden Knights nose guard Scott Bargisen, flanked by his parents, Scott and Johanna, will play football for Misericordia University in the fall. In back row, from left are NV/Old Tappan High School Principal Dr. Bruce Sabatini, Knights head football coach Brian Dunn and Athletics Director Tom Kaechele. Bargisen earned a lot of scholarship money at the NV/Old Tappan awards night last month and that will certainly help him pay for college. He won the James T. Earlis, Michael LaViola Foundation and Northvale PAL Wrestler scholarship awards. "I got the most money of anyone that night," he said. Being a pretty good football player also helped him get into college. He said the Misericordia coaches are projecting him as a rushing linebacker or a defensive end, if he can gain some weight. "He's a tough, hardworking nose guard," said Golden Knights defensive coordinator Joe Clause. "He's quick off the ball and good with his hands. He's a strong, strong kid who did a great job in the defensive line rotations. He knew his role and stuck to it."